Coffee shop, gift shop, concierge service, a florist, a newsstand – it’s like living in another dimension. With the Hilton Park Lane you have what must rank as the two names most synonymous with luxury and opulence pooled into one memorable expression. 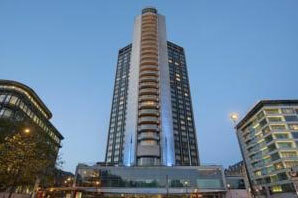 Located at the very centre of the Park Lane and Mayfair district with stunning views across Hyde Park the Hilton boasts an almost implausible range of unique selling points. Guests lucky or affluent enough to stay here can look forward to indulging in the Hilton’s famous Chocolate Afternoon Tea in Podium, enjoy cocktails in the POP Bar, get a taste of island life at Trader Vic's or spend a stylish evening in the hotel’s nightclub, Whisky Mist at Zeta. The 28th-floor restaurant itself is worth the price of entry alone with its delightful 360° views of the city. Work out in the Fitness by Precor health centre and follow it up by relaxing in the sauna and steam room. Massages and facials are also available in Purity Mind Body.